Today is 10/10/10, a very unique date, because the number 10 signifies perfection. 10 appearing three times in a date signifies perfect perfection . So, I would like to quickly release the first version of the 1Malaysia song that I wrote and composed after I finished my UPSR exam on 23 September. Here’s the video of me performing the song, titled Kita 1Malaysia. I dedicate this song to our beloved Prime Minister and First Lady who initiated the 1Malaysia spirit, & every Malaysian. In this video, I am wearing Baju Melayu, a traditional Malay outfit. I also sung the song in Malay because it is our national language. This is the first version of the song. The complete version of it, sung in Tamil, Mandarin and English, with its instrumental, will be uploaded on 20/10/2010! I wrote the song because I would like to express my patriotism and also to share the beauty of my country to the world. My country is made of 3 major races – Malay, Indian, and Chinese. So, we can easily get to know different cultures and religions. To get to know more about my unique country, you can view my blog post about Malaysia filled with colorful pictures. The post is about Kuala Lumpur, the “heartbeat” of Malaysia, with modern buildings, landscaped parks, fabulous food, colourful bazaars, multiple cultures-religions-traditions, you name it. In fact, this blog post is an entry of the Blog4FT contest, in which I won the second place in the Junior category (below 18). Second from right is Datuk Raja Nong Chik, the Minister of the Federal Territories and Urban-wellbeing, who initiated the contest. I believe it’s a blessing to talk about the beauty of your own country, because in return, you’ll be blessed one way or another. 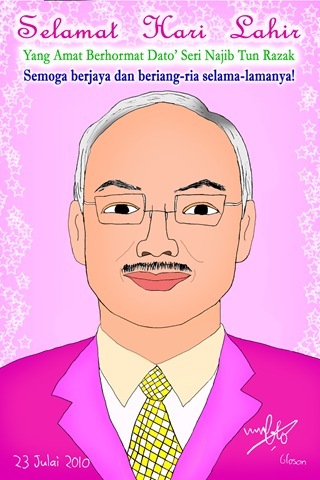 I got to know more about my country when we got a new Prime Minister, Dato’ Seri Najib Tun Razak. 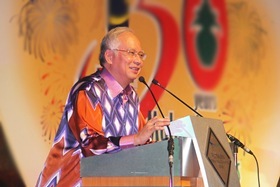 I really admire him because he is a very wise Prime Minister, and handsome too. According to his principles, he wants to make sure that the government achieves a society-centered condition. He always looks for people’s feedback and participation about his ideas so that he can flash out his best policies for his country. His wisdom and humility inspired him to create the 1Malaysia vision, “People First, Performance Now”. 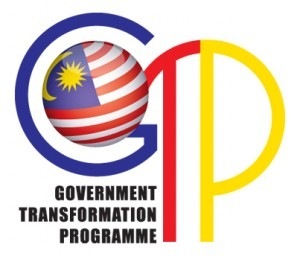 His Government Transformation Programme (GTP) will lead our country towards a high-income society towards 2020. With his wisdom and diligence, I believe this GTP program will be a success and bless every rakyat (people) of Malaysia..
“You know that when I make a promise I make sure that it is delivered,” he said on October 8, in front of a crowd of 13,000 Malaysian Telugus at the 150-year Malaysian Telugu Heritage Celebrations. (source: The Star, 9 Oct 2010, pg N2) My Prime Minister is truly a man with highest capability and humility. 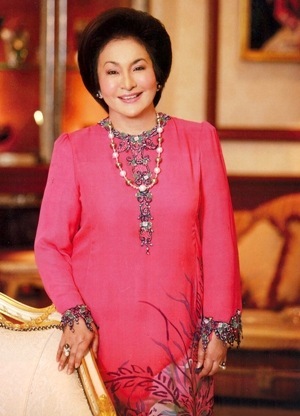 I also adore my First Lady, Datin Paduka Seri Rosmah Mansor, who, to me, is the most beautiful First Lady among all First Ladies in the world. 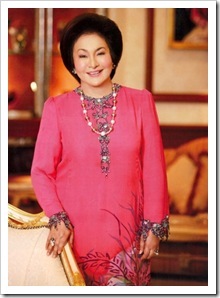 I regard her as the Mother of Love of Malaysia, as she is very focused on children education. She is the pioneer of the PERMATA Pintar Project, in which she locates gifted children to bring them up in a special school, which is opening next year for gifted teens 15 and above. Very memorably, last year on 10 July 2009, she took notice of me. So, she and my Prime Minister organized a press release as encouragement and recognition of my talents as a funny poet and a tech blogger. 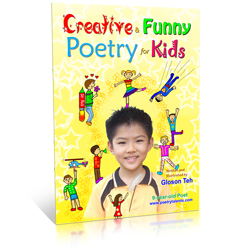 During the meeting, the Prime Minister read aloud my poem Autumn from my poetry book Creative & Funny Poetry for Kids, which was published in June 2009. I was very happy that he enjoyed my poem. I also acted out my poem If I Did Write a Poem, and they enjoyed it and laughed. And most recently, my First Lady has organized the first ever First Ladies Summit, themed ”A Child Today, A Leader Tomorrow”, which will be attended by First ladies, ministers and special envoys from 31 different countries. The summit will focusing on issues pertinent to children, such as poverty, domestic violence, stress, lack of parental care, etc. the current generation of children will grow up to become good leaders. the future generation will not have the face the problems mentioned. You can see that the reason I call her the Mother of Love is because she is really diligent in taking care of issues related to the welfare, especially the education, of children. Meanwhile, my country’s education system is very advanced. 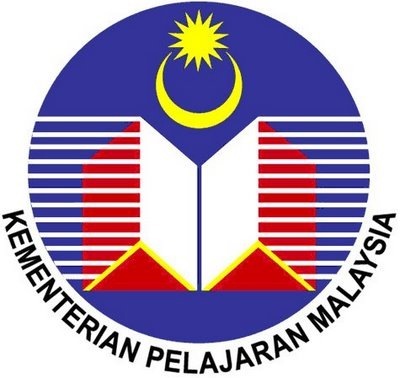 Part of the GTP is the National Key Results Area (NKRA), which aims to provide accessibility to quality education. It focuses on four areas – pre-school education: the literacy and numeracy programme (LINUS); high performance schools (HPS); and improved performance management of head teachers and principals. 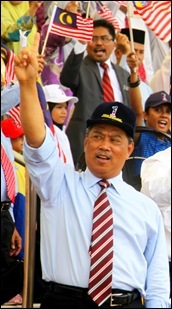 A great thanks to our Minister of Education, Tan Sri Dato’ Muhyiddin Yassin, (who is also the Deputy Prime Minister; left) and his team in MOE for providing quality education for all. 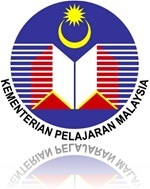 I feel so proud to be a Malaysian student because our country’s education system is always being updated and upgraded. 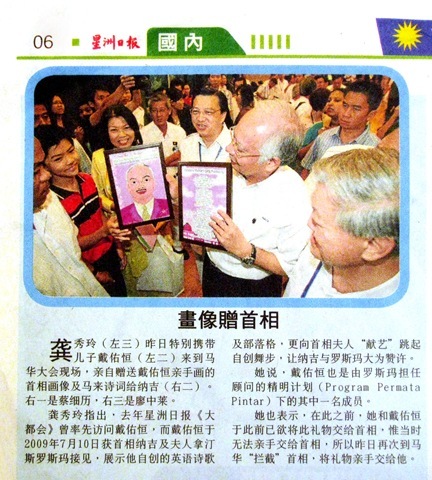 On 10/10/10, I also gave a special present to the Prime Minister of Malaysia after his speech in MCA (Malaysian Chinese Association). The present is a portrait of him that I drew and a poem of him that I wrote to show my appreciation for his excellence in leading the country and for his birthday. While I was giving my present to him, I told him that this is my special portrait for him for his birthday. He looked at it and enjoyed it, and jokingly asked me why I drew his moustache all black and his hair all white. Then everybody laughed =P . Haha. 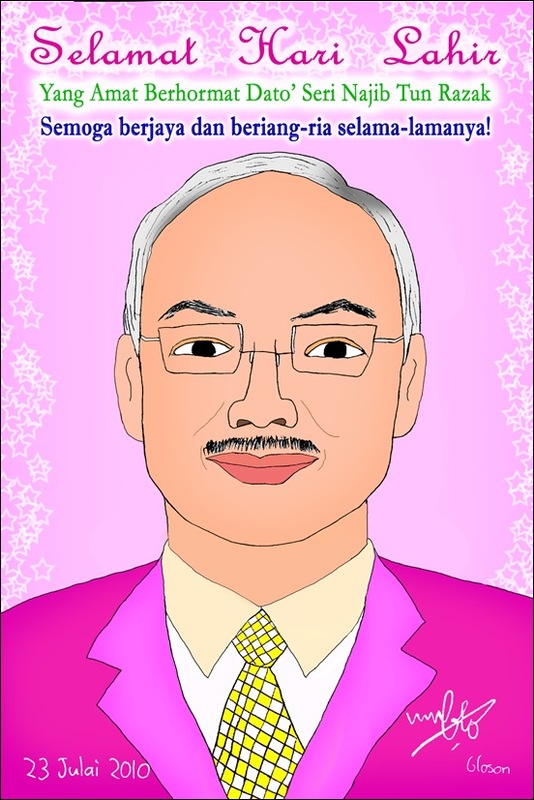 Actually, I drew it like that because it makes my Prime Minister look more fun and handsome. He showed my portrait and poem to the press who were busy photographing him. I found out that the photograph was published in Sin Chew Daily. A big thank you to Sin Chew for acknowledging my gifts. 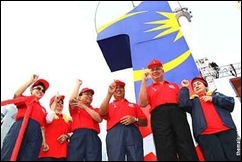 From right to left: MCA President Datuk Seri Dr Chua Soi Lek, Prime Minister Datuk Seri Najib Tun Razak, Deputy MCA President Datuk Seri Liow Tiong Lai, my mom Grace, & me. Here is the large version of the portrait and the poem. There! I hope you have enjoyed my song, my tribute to my country, and my portrait and my poem of the Prime Minister! I’m new here to your blog and I like your song, and also amazed on playing the organ. You are very talented in playing the organ without even looking at the keys. Hahaha! I enjoy it and you deserved to be talented and gifted. Hey Jeff! Thank you very much Jeff! I really appreciate the kind words! Cheers! Hey Gloson, You are indeed such a very talented young man. I bet how proud your parents are because of you. The song you compose as well as the poem and the portrait was so good. May you always keep that patriotic spirit within you. Keep it up! Cheers! Damn, that’s not fair – your developing to many talents. So your going to be a professional blogging, poet and singer. Best of luck. Peter J´s last [type] ..Guest posting competition – Lets win it! LOL. Thank you very much Peter! Best of luck to you too in your blogging career! You’re awesome on the keyboard and singing and poetry! Tell me, what else that you DON’T know? Haha… thanks so much Charlton! You’re awesome too! This is just one more of your talents shining through! I hope you are able to inspire other young people in your country to do more and be more. Thank you for sharing your gifts. I always enjoy learning tech tips from you, too! Thanks so much! I appreciate the kind and encouraging words and I’m really glad you like my blog posts! Great song, and awesome keyboard skills (that goes for your blog too, kiddo!). Wow! You’re so famous!!! Keep it up kiddo! Your country is really proud of you and you have all the reasons to be proud of your country too. You’re a kid with really great talent, I now you’ll really have a great and nice future. All the best! Hi Andrew! Thank you very much! I really appreciate the kind and encouraging words! I respect you for your talents. Must be pretty hard to keep up with so many things going on with your life. Keep up the good work there. I’m sure a lot of older bloggers want to learn from you as a successful blogger. You look great lol in the Malay outfit and song is too good. You are the rising star of Malysia. I watched your complete song and waiting for the full version. I know why mom said that is because almost everyday i am chatting with you on Skype. I also take out both the poetry talents book by you to read everyday. Haha… Thank you very much. I’m so glad you are enjoying my poetry books! And it has been great chatting with you on Skype! I know you’re probably busy with school, music and whatnot, but I was wondering – how about a fresh blogpost for us eager readers? I apologize. Yeah, I’m indeed busy with those but I am coming up with a blog post as well. Stay tuned! Take your time and do good!! Thank you so much Mrinmay! I really appreciate it! How did you know that was a Casio? Wow! Really? You guessed so accurately! Keep working on your talents! Haha. Thank you very much Moon! You have a great talent in experimenting and blogging tho . Thank you, thank you, and thank you very much Alex! I really appreciate it mate! It shows you have a great talents, and not only blogging. Though i am from Indonesia, i am still proud of you. All the best for your future, Gloson, i am sure you will get there! Thank you so much Kimi! I really appreciate the kind words and encouragement. You are very talented in making cool tutorials too =) . I really like them. I am just so glad I have found your blog I agree with Alex’ sentiments so will just say wow, wow and wow again too. I loved your song and thanks for translating it for us English speakers. Most beautiful and so patriotic to your country. If young people in your country have the values you have and follow their dreams your leaders will be most happy. 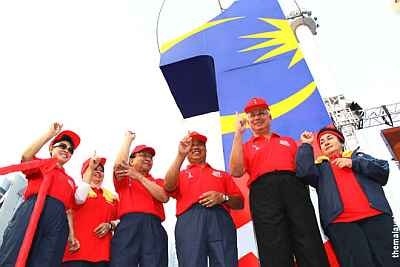 It will be a bright future for Malaysia. I’m off to read some of your poetry now. Thank you so much for dropping by and for the kind words. I’m really encouraged that you like my song! And thanks so much for reading my poetry! I really appreciate it! 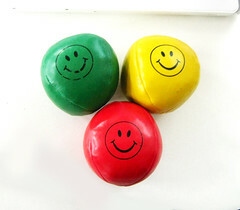 you are just awesome, just love dropping by! keep it up! This is extremely awesome, Gloson! You acted exactly like a pro by singing on a stage with so many listeners, you were extraordinarely! Also, you have a lot of skill and talent in what you’re doing – writing poems and drawing. Congratulations and keep up the good work! Wow, it’s my first visit to your blog. I didn’t realize it’s written by a 13-year-old boy until I read your bio. You’re such a talented boy! wow ,writing a song for the country and making it a video and launching it even before the end of teens. Some times you make me feel embarrassed but also makes me feel like,life should have achievements and they really do count.